A sweeping novel that brings to life two love stories, ninety years apart, set against the rich backdrop of war-torn India. In 1947, American historian and veteran of WWII, Martin Mitchell, wins a Fulbright Fellowship to document the end of British rule in India. His wife, Evie, convinces him to take her and their young son along, hoping a shared adventure will mend their marriage, which has been strained by war. But other places, other wars. Martin and Evie find themselves stranded in a colonial bungalow in the Himalayas due to violence surrounding the partition of India between Hindus and Muslims. In that house, hidden behind a brick wall, Evie discovers a packet of old letters, which tell a strange and compelling story of love and war involving two young Englishwomen who lived in the same house in 1857. Drawn to their story, Evie embarks on a mission to piece together her Victorian mystery. Her search leads her through the bazaars and temples of India as well as the dying society of the British Raj. Along the way, Martin’s dark secret is exposed, unleashing a new wedge between Evie and him. As India struggles toward Independence, Evie struggles to save her marriage, pursuing her Victorian ghosts for answers. 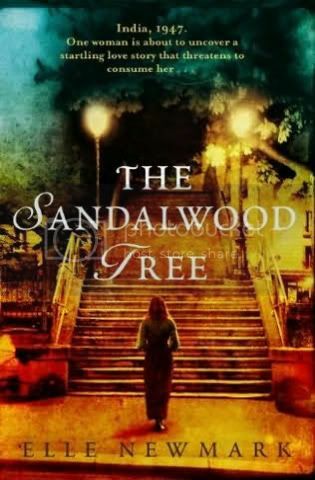 Bursting with lavish detail and vivid imagery of Calcutta and beyond, The Sandalwood Tree is a powerful story about betrayal, forgiveness, fate, and love. I thought ths was a very good book. It did take me some time to really get into it but all in all it was good read. In my opinion I thought it was a little to long and maybe it should have been 2 shorter books.